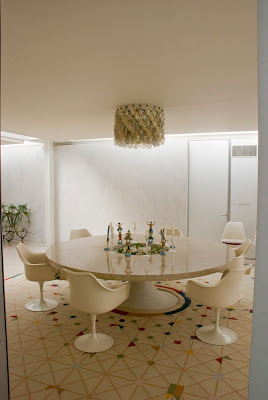 Imagine a home in the center of a Dan Kiley landscape, architected by Eero Saarinen with interiors by Alexander Girard. 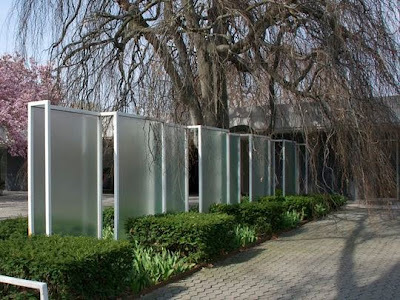 Now imagine this anomaly erected in the Mid Century Modern wonderland of Columbus, Indiana. 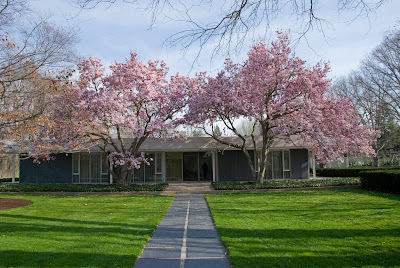 Miller House, built in 1957 for architecture passionista, J. Irwin Miller, is the pinnacle of modern residential design. Some of the period's greatest minds collaborated to form structural poetry. We were among the first people to tour this home. But your chance is coming. 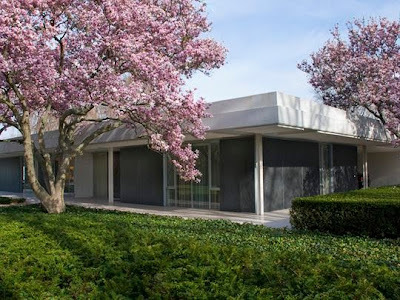 The Indianapolis Museum of Art (IMA) is prepping the home for public tours as early as summer 2011. In the meantime, lets take a quick peek around the house. The approach makes knees weak. Custom dining table designed by Saarinen himself. Mid Century Modern kitchen to cook-up a massive plate of envy. Here's the part that made me cry. Literally. Take a dip in this conversation pit. Drool over these Girard textiles while I get a tissue. And now for the multimedia portion of our program. Photo slide show by the Indy Star. 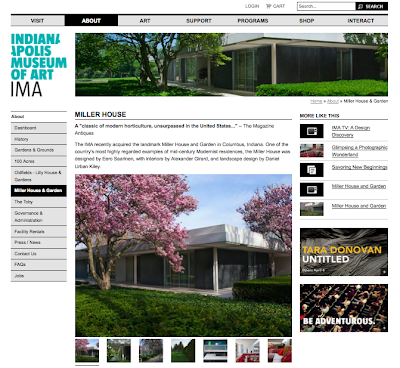 IMA's preview of Miller House. Discovery of a box containing original Girard swatches for Miller House. Like Christmas morning. Check out all the architectural goodies Columbus, IN has to offer for a weekend getaway. Or go ahead and book yourself an architecture tour. That look at the swatches was killer. Are those going to be on display? I need a reason to come back for a visit. i'll meet you in the conversation pit. beyond beyond. Love all the Girard stuff. 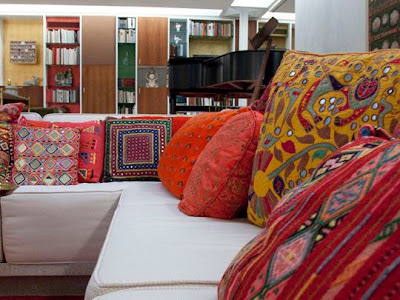 He lived in Santa Fe for a time and donated a huge collection of his folk art to our folk art museum here. The Girard Collection there is amazing and is the highlight of the museum. Until our purchase of a MCM house here, I had forgotten about his link with modernism - I thought of him as merely a major collector of folk art. But it's great to see him use all that color and vibrancy in a modern setting. 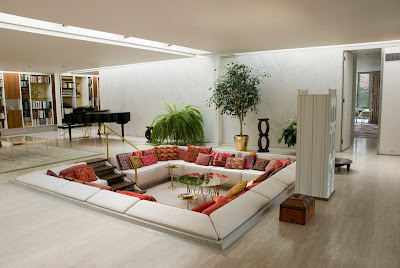 Love that conversation pit!!!! 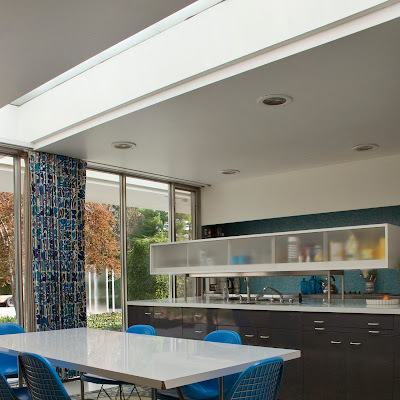 Took the tour yesterday...I love that house and the interiors-great use of color! i think i recently pinned that pit image from somewhere. it's truly awesome! those need to be brought back into everyday style!